The FAIR'N GREEN certification is intended for all winemakers interested in sustainability. Entrepreneurial spirit and vision are required to expand new thinking but at the same time concrete steps. That is FAIR'N GREEN. For the certification according to FAIR‘N GREEN, formal and substantial requirements are to be fulfilled. A certificate confirms the fulfillment of these requirements. All wine estates become members in the association FAIR and Green.e.V., which issues the certificate after the external audit. For this, you will go through a certification process and after the accomplished audit you are entitled to make use of the FAIR'N GREEN label. The certification is valid for the whole wine estate. All wines which are cultivated and produced by this wine estate are certified. It is not possible to certify single products. Would you like to become a sustainable winery, and do you attach importance to the sustainable production and processing of your products? With FAIR'N GREEN you get a qualified and comprehensive sustainability system which will actively support you on your way to sustainability and allow you to communicate this orientation to third parties. FAIR and GREEN knows your business cannot be transformed completely in one day which is why FAIR and GREEN, in cooperation with authorized consultancies and independent auditors, considers itself as your guide on this way. The comprehensive consulting as part of your membership includes, among others, the calculation of the carbon footprint and a life cycle assessment. After the analysis of your company, the determined and provided data is verified by an external auditing institute. If all data is correct and your business can already be considered as sustainable, you will be awarded with the FAIR and GREEN certificate, after notification of the association. With this first audit the consulting and development of your vineyard is on no account terminated. Throughout the entire duration of your membership you will be provided with guidance and will continuously develop according to our guidelines. 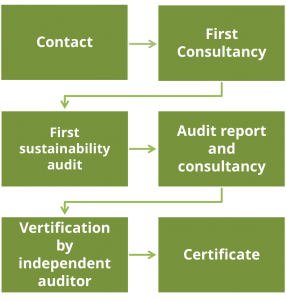 The certification system FAIR'N GREEN and the FAIR and GREEN e.V. association have a solidly united graduation of prices, i.e. larger companies are slightly more charged, so that also smaller companies can engage in sustainable management. The certification cost depends on your cultivated area (in hectares) as well as your process and marketed amount (in litres). Besides the certification and consulting costs you pay a membership fee which is linked to the size of the cultivated area. All fees are exclusively spent by statute and serve the strengthening of the brand FAIR and GREEN and spent in the interest of the members. In addition to this, costs for the external audit incur. If you are interested in a membership with certification or have any further questions, we are looking forward to getting into contact with you personally – please do not hesitate to contact us! If we raised your interest please feel free to contact us. In a first interview we will clarify all your questions and, if applicable, prepare your access to FAIR and GREEN e.V. association. First consultancy before joining FAIR and GREEN e.V. Mailing of the catalogue of criteria and the list of required documents. 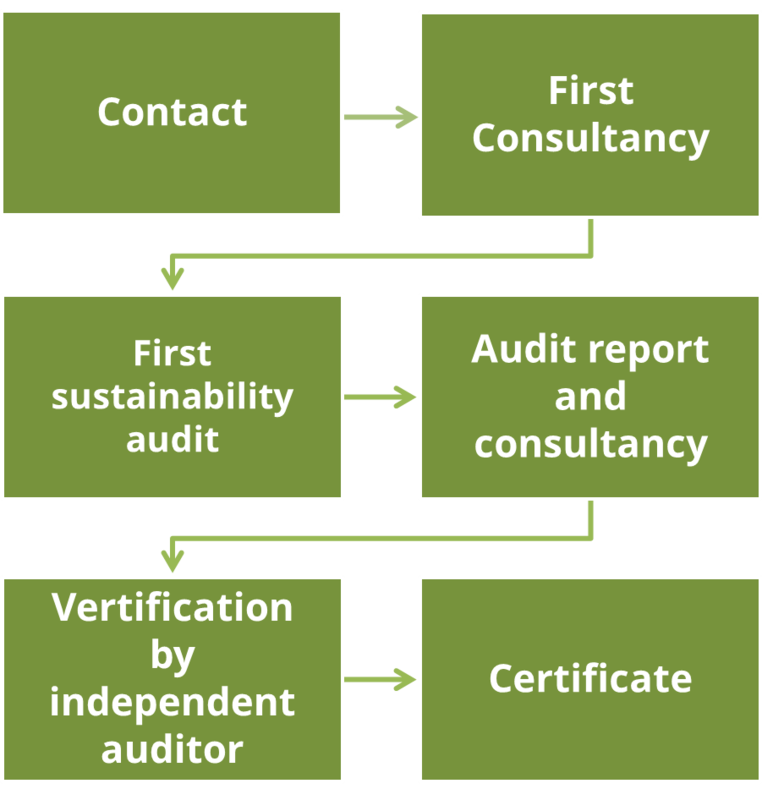 First audit via phone according to the FAIR’N GREEN criteria by the consultancy. In cooperation with you, the consultancy prepares the catalogue, including 150 criteria in 28 categories. The latter one is divided into the four main sections Business, Society, Environment and Supply Chain. Finishing of an audit report and visit on site. Discussion at the wine estate. Analysis of the proposals. Submission of the documents to the neutral validation. 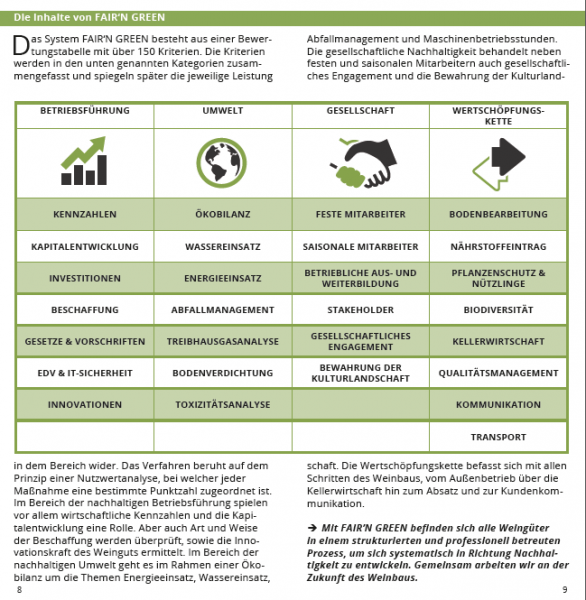 The independent auditor that is consulted by Athenga GmbH and authorized by FAIR and GREEN e.V. association verifies the data you and Athenga GmbH provided. If these stand the audit and comply with the requirements for a certification, further steps will be initiated for officially certifying you. After the transfer of the audit results, FAIR and GREEN e.V. association entitles you to use the FAIR’N GREEN certificate. The use underlies certain regulations that you will be informed about by FAIR and GREEN e.V. association. After successful certification you are entitled to label your wine products with the sustainability label. Of course, you are then allowed to advertise with your wines with the certification and the seal. Become a member of the FAIR'N GREEN Sustainability Initiative!